I'm posting this more for posterity than for bragging rights. Every Monday night, Australian tweeters gather around their warm laptop/tablet/phone devices and make snarky comments about Q&A, an ABC discussion program that purports to provide intelligent discourse about issues affecting the Australian cultural and political landscape, but generally dissolves into muckraking, shouting, and running commentary about Julia Gillard's words/actions/jackets/arse. As it happens, I'm not even a serious #qanda tweeter, as the hashtag goes. But last night I was expressing a lot of admiration for British actor and writer Simon Callow via the micro-blogging service. The man simply has the most seductive voice on the planet, and Tony Jones was guilty of the criminal offence of letting the other guests speak when it should have been All Simon Callow For All Time. If Simon Callow was the voice of my GPS unit, I'd never get out of the car. If Simon Callow was a telemarketer, I would upgrade my internet plan. And if Simon Callow ordered me to frame someone for murder, believe me, they'd be fitted-up better than the Mona Lisa. All for you, Simon, you silken-voiced white fox. I realise he's much beloved for his extensive film and stage work (including Four Weddings and a Funeral); but it's a little-known TV role I really love him for. And no, it's not as Charles Dickens on Doctor Who, but rather a sweet little mid-80s sitcom called Chance in a Million. He starred as Tom Chance, a man plagued/blessed by coincidence. Brenda Blethyn was his love interest. I saw half a series of it on late night TV around ten years ago, and they were both utterly charming in it. Like all British sitcoms of the 1980s, it's a bit naff, but I remember it being really quite well-written, and more clever and modern than I would have expected. I sometimes wonder if I should track it down on DVD - but I fear it may be rubbish if I watch it again now. Like that time I rented my Dad a Best Of Benny Hill VHS, and he watched five minutes before turning it off, saying sombrely, "It's just not really the same." And this from a man who still sniggers at the word "boobies". Dave Allan, though, that still gets a run. 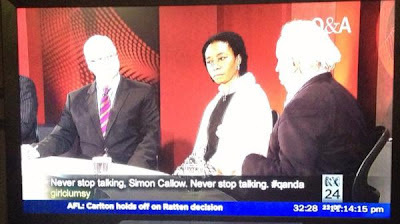 Have you ever got a tweet up on #qanda, or do you eschew it as left-wing commie rabble-rousing? And, tangentially, is there a TV show you've revisited that proved a terrible/excellent experience? I have a few people on my twitter feed who watch Q&A (and also federal parliament qt & #qqt) who can do the show throwing/nerf gunning for me. Saves a lot of stress and I get to see some of what is happening & summarized. besides at that time I almost ready for bed. I have a few older TV shows on DVD. Occasionally grab one out for a flick or because the mood takes me. "The Professionals" for biff & explosions. "Space Above & Beyond" for thinky biff & explosions. "Blakes 7" for thinky explosions in fetish gear. Plenty of Star Trek (all flavours in this house). No DrWho on DVD yet. That mammoth investment will have to wait. Wife and I are working thru Friends boxset when the ratings season ends. It is relaxing and holds up pretty well, particularly without ads. I was lucky enough to see him play Falstaff in the Merry Wives of Windsor - he's a wonderful actor with an awesome presence. Bah! You and all your #qanda cohorts have fallen into the trap of promoting someone's brand. Few people have much to say about the discussion and most people are sucked into the honey pot of having their tweets broadcast. After all this time the traditional media still has its allure. Not that I'm against live tweeting. I finally got the point of live tweeting when I actually followed along with the royal wedding. It was a blast. But I've got to say my twitter feed's signal to noise went up like crazy when I figured out how to mute the #qanda hashtag. Also #BBAU #bold #theshire #artwiculate, foursquare and any tweet that begins with "that awkward moment". I'm not sure about TV but I picked up Weekend at Bernie's for $7 because I LOOOOVED it when I was 13. Never twittered Q7A, never watched it to be fair. I did however catch Simon Callow doing his one man live Dickens show when he was in Melbourne a few years ago. Magnificent, simply magnificent. If you get the chance go see it.